Uncovers simple and practical steps to live authentically… a unique and energizing blend of Eastern Thought, Western Psychology, and the "inner workings" of the Universe. A Refreshing and Innovative Approach to Self-Help and Discovery. Who am I? Why am I so stressed? How can I be more balanced? 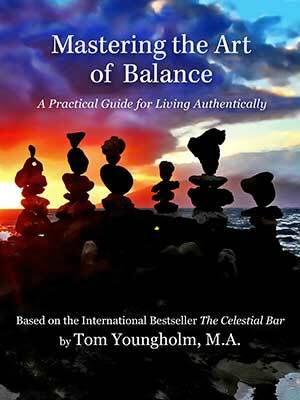 Mastering the Art of Balance uncovers simple and practical steps to live authentically. This material is a unique and energizing blend of Eastern Thought, Western Psychology, and the inner workings of the Universe. As you read this stimulating book, you’ll awaken to the power of Reducing stress, Eliminating past issues, Addressing today's challenges, and Living authentically. Tom was devastated when he lost his job, home, and marriage after the financial meltdown in 08. He used those challenges to expand, clarify, and more fully embrace the wisdom within his first international best-selling book The Celestial Bar. The results of his efforts have manifested in this insightful, essential, and practical guide. You can use this information, no matter what your situation, to navigate todays' hectic and crazy world.